thursday, 9:11 PM. I broke a record today for finishing my hw and study earlier thn i used to. One thing. Would you help someone who asked for you, but he/she asked you rudely? i disagree with it. So I decided to not help that person. at least cakaplah baik baik sikit kan.. huh..
ugh. whtever. Let him be. i won't help him unless he said sorry or something. Be nice to your sis. I'm the only sis you got! You little brat. just say sorry, even it is the millionth time. I would forgive you. Janganlah kasar sgt don't act like a beast! I hate it when u do that.. wowwie!! awesomeeeee.. heaven i'm telling you! 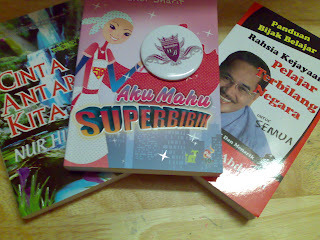 i'm so excited to post this.. i just came back from a BOOK FAIR in PWTC.. It's super duper awesome.. It's a place I called 'heaven'..
After all, books are my second bestfriend.. My mom promised to take me there about a week before.. hehe. So, today.. I bought 3 books. 2 novels and 1 motivational book. And the best part was I met Ain Maisarah, the famous local author.. I had almost all of her books.. She's a great author i'm telling you.. She was so pretty back then. Unfortunately, i didn't manage to get her autograph.. huhh.. Maybe next time. Me and my mom had a great time.. even it's kinda tiring walking non stop browsing for books.. I also manage to stopped by a booth called 'Rumah Pink Ain Maisarah'. I bought a 'Wannababes' badge.. haha. effing cool..
Cekodok Weng.. I miss you guys! it's a typical monday blues. 11.29 pm. I wanted to post this for so long but didn't really have the chance to. SO here goes. 2 years ago, back when i was in form 1. 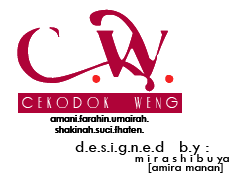 We have this group called 'Cekodok Weng' founder suci and farahin. 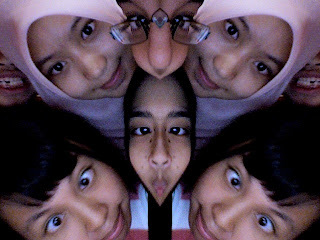 There were 7 girls with different personalities and retardednesssss.. hehe. 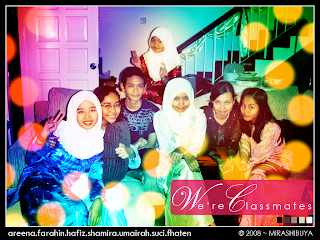 We were so closee.. every second, every minute, every hour we spended the time together especially at school. I missed 'CW' a hell out of a lot! I wished we could do some reunion or something tht could get us back together for just a day..! hmm. yeah basically each 'CW' members have their owned trademark/sign. Mine was a butterfly. We also had a our owned BOOK. I love that book. There were soo many precious moments we kept inside that book. I don't write much. All the words typed came from the heart. I do not own a diary nor a journal, this is my diary.